If you are looking for the Spring Fashionista Blog Hop please click here. It seems as though lately all the protagonists in the urban fantasy genre are women. Now don't get me wrong, I do enjoy seeing women taking names and kicking butts but I also enjoy seeing/reading about men doing the same. This is what attracted me to Deacon Chalk. He is big tattooed man with a shaven head and a heart of gold for anyone being terrorized by monsters. And there is a woman taking names in BLOOD AND MAGICK who just happens to be Deacon's lady Tiff. This book really starts out with a bang or more correctly an explosion and goes from there. 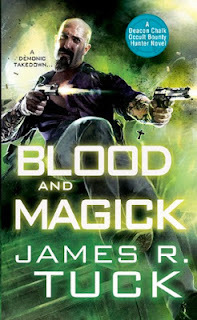 BLOOD AND MAGICK is very fast paced with a strong storyline interspersed with just enough downtime to give the reader a chance to catch a breath. This is a book that I just didn't want to set aside as I couldn't wait to read what happens next. I did have a couple issues with the book such as Deacon calling the older pagan gods demons and few editing errors that slipped through. These are not enough however to keep me from hunting up the back issues so that I will be all caught up before the first book. I do recommend this book to anyone who enjoys the urban fantasy genre. I do have to issue a warning however about the language, violence and strong christian bias that is present in the book.